Bear, Elizabeth. New Amsterdam . Subterranean 2007. What if: New Amsterdam did not become British until the nineteenth century and growth of the American colonies was blocked by the Iriquois. Series note: Includes the short stories collected in New Amsterdam plus the novel Seven for a Secret , the novella "The White City". 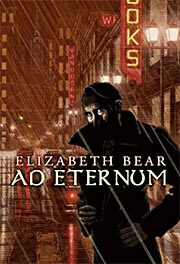 the novella ad eternum , and the story "Underground". Summary: Collection of seven stories about a forensic sorceress, including "Lucifugous", "Almost True", "Wax", "Wane", "Chatoyant", "Limerant", and "Les Innocents/Lumiere". Series note: Forst volume of New Amsterdam. Published: Subterranean 2007 (1596061065BUY), 2008 (1596061634BUY). Series note: A story in New Amsterdam. Published: In Subterranean #5 (2006); and New Amsterdam , Subterranean 2007 (1596061065BUY), 2008 (1596061634BUY). 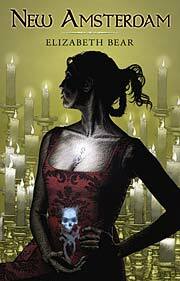 Published: Serialized on-line by Subterranean Press beginning Jan. 1, 2007. Published: New Amsterdam , Subterranean 2007 (1596061065BUY), 2008 (1596061634BUY). Summary: A murder mystery in New Amsterdam. Published: In Interzone #201 (Nov/Dec 2005) and New Amsterdam , Subterranean 2007 (1596061065BUY), 2008 (1596061634BUY). Published: In Interzone #203 (Mar/Apr 2006) and New Amsterdam , Subterranean 2007 (1596061065BUY), 2008 (1596061634BUY). Published: In New Amsterdam , Subterranean 2007 (1596061065BUY), 2008 (1596061634BUY). Awards: Finalist: 2007 Sidewise Award for best short-form alternate history. Bear, Elizabeth. 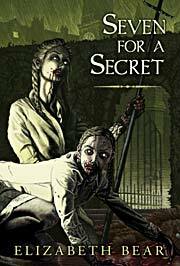 Seven for a Secret . Subterranean 2009. Series note: A novel set in New Amsterdam. Bear, Elizabeth. ad eternum . Subterranean 2012. Summary: A vampire returns to New Amsterdam after six decades away, and is made an offer which would require surrendering the safety of relative anonymity. Series note: A novella in New Amsterdam.